Nature has an amazing ability to use camouflage....sometimes it's an animal using disguise as part of a defense or it may be an animal using camouflage to catch prey. These disguises that are used to deceive other animals are also very effective against photographers! Last week I was walking around a small pond at Mason Neck State Park. The pond was covered in a neon green algae, making it almost impossible to see into the water. I was watching turtles crawl in and out of the water when I noticed a funny shape on a rock. On closer inspection I realized the shape was that of a snake.... a neon green snake. 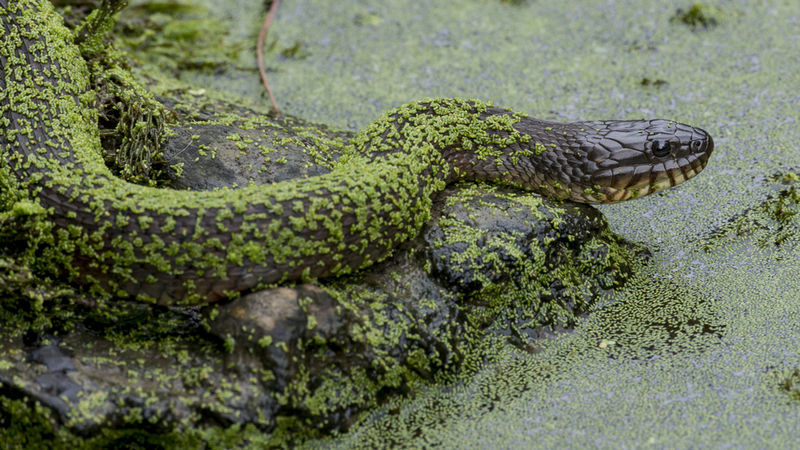 A small water snake (non-venomous) had utilized the neon algae to disguise his body and blend in with the area around the pond. He was sitting on a rock with his head hovering over the water so that he could catch a small fish that might swim past. Because of the snake's camoflauge, he was well disguised from any raptors flying overhead (a great move since the Osprey were all around and he was sitting on top of a rock!) and also disguised from his prey. I watched him for awhile hoping to catch him mid-hunt, but he was clearly distracted from hunting by my presence. I snapped a few shots and moved on to let the circle of life run it's course.